Coconut oil is a vegetable oil that is made from the coconut of the palm tree. Much has been reported about the potential health benefits of coconut oil, which range from weight loss, skin treatment and hair health to blood sugar control and heart health benefits. 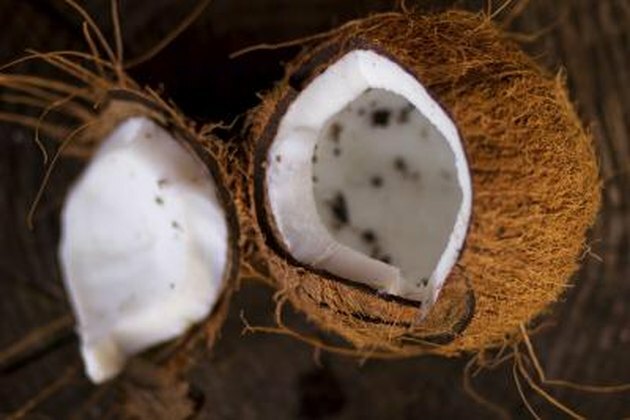 Interestingly, coconut oil does not contain many vitamins. Vitamin K is found in coconut oil. In 100 grams of coconut oil, 0.5 micrograms of vitamin K is found. Vitamin K helps make proteins for healthy bones and blood clotting. According to the Harvard School of Public Health, in a study reported in Nurses' Health Study, women who get at least 110 micrograms of vitamin K are 30 percent less likely to break a hip than those who do not. Coconut oil is not a significant source of vitamin K.
Vitamin E, also known as gamma-tocopherol, is found in coconut oil. The USDA reports 0.20 milligrams of gamma-tocopherol is in 100 grams of coconut oil. Vitamin E is potentially effective in helping to treat Alzheimer's disease, rheumatoid arthritis, premenstrual syndrome, male infertility, sunburn and many other conditions. The Office of Dietary Supplements recommends daily allowances of vitamin E of 15 milligrams per day for people over the age of 14 years. Coconut oil is not a significant source of vitamin E.
The Linus Pauling Institute at Oregon State University cites choline not as a vitamin but rather as an essential nutrient. Choline is found in coconut oil at levels of 0.3 milligrams per 100 grams of oil. The daily recommended intake of choline is 550 mg/day for men and 425 milligrams per day for women. Coconut oil is not a significant source of choline.